The entry deadline is Friday 21 June 2019. Entering carefully selected awards can be an important part of your marketing strategy. Winning an award, or even being a finalist, provides numerous opportunities for increased exposure. Leverage it correctly and it’s a great way to attract new business or even new recruits. It all starts though with deciding which awards to enter. The table below lists the key awards which take place throughout the year. We’ll keep this updated regularly, so make sure you check back often and follow us on Twitter (@yardstickagency) where we will make regular announcements. 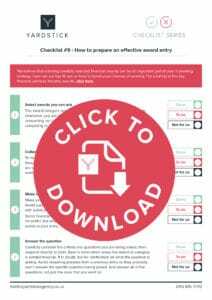 Our checklists will help you create compelling entries and then promote that success.